Say Goodbye to Wasted Space! 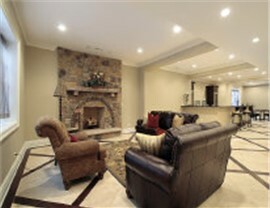 Make the most of your home by turning your unused basement into a relaxing, enjoyable living space. 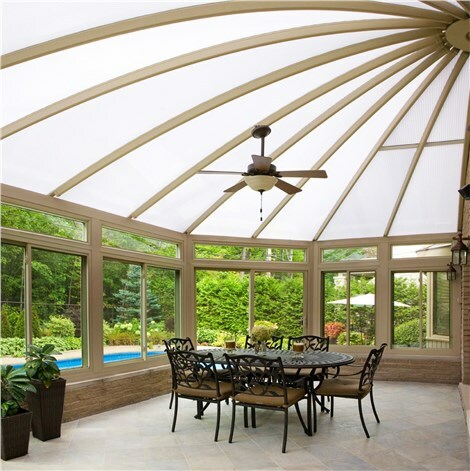 If you're looking for a convenient way to add functional living space and value to your Long Island home, you don't have to look far; the perfect solution may be right beneath your feet! With the help of Sunview Enterprises, you can transform your empty, unused basement into a comfortable and beautiful living space that the whole family can enjoy. When you need a company with the skill, resources, and equipment for a full-service basement renovation, turn to Sunview Enterprises. Our factory-trained installers are prepared to handle every aspect of a Suffolk and Nassau County basement remodeling project—from proper permitting and electrical wiring to professional plumbing and egress window installations. For jobs of every size, you can count on our basement remodelers for a job done right! Whether you need basement flooring that will stand the test of time or a well-designed basement ceiling to enhance the overall look of your room, we can handle the job from start to finish. Our flooring options include wood, tile, carpet, and more, while we offer various styles and materials for ceilings—ensuring you get the finished basement that works best for your needs! Unlike some basement remodeling companies on the Island, we at Sunview Enterprises offer homeowners a full-service solution—from initial basement design to flawless, mess-free installation. Our remodeling team boasts some of the most talented designers in the region, who will help you choose the best layout, features, flooring, and ceiling to create your one-of-a-kind basement makeover. At Sunview Enterprises, we stand out from the crowd of local basement remodeling companies by offering the highest-quality basement wall panels available today. Made from magnesium mineral board, our wall panels are resistant to common threats like moisture, mold, fire, and pest infestations. They're also fabricated to be 3-7 times stronger than conventional wall materials! Egress windows are essential for any finished Nassau County basement remodeling project. Not only do they ensure that your property meets local building codes, but they also provide a safe, easy-to-operate exit in case of emergency. Trust our skilled remodelers for an egress window installation that's expertly designed and flawlessly installed. Standard basements are typically finished with low-quality fiberglass, a material that has open cell pockets allowing air to move freely through. To eliminate this costly air and moisture leakage, our innovative wall panels come with Expanded Polystyrene Foam (EPS) basement insulation—improving your home's thermal efficiency while repelling mold and mildew. At Sunview Enterprises, we never settle for anything less than the best. That's why we install an industry-leading basement finishing system that looks great and protects your home from hazards like mold, rot, fire, and pests. Our unique wall panels are rigid, insulating, and can be installed without any vinyl tape or unsightly seams, giving you the beautiful and durable basement you deserve. Looking for a cool place to hang out with friends on the weekend? Install a basement bar to make your home the new party spot! 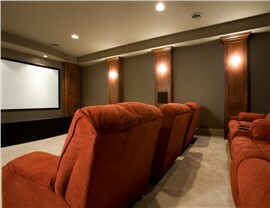 Or bring Hollywood into your own home with a basement home theater from Sunview Enterprises. Our high-quality wall panels reduce noise transfer, so even the most action-packed flicks won't disturb the rest of the house. Or maybe you're looking to create an extra room to inhabit – in which case you should look into installing a basement bathroom or even a basement kitchen! When you work with our skilled basement remodelers, you can rest assured that every aspect of your bathroom or kitchen installation—from the plumbing to the walls—will be treated with the utmost professionalism and care. Need a place to have friends over to watch the game? Get that awesome man cave you've always wanted by working with us to design it yourself! 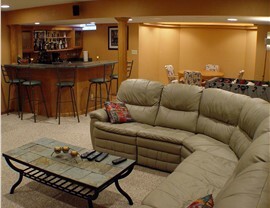 Our high-quality basement finishing systems ensure lasting durability and strength so you'll be able to enjoy your man cave for decades to come. Let's Build Your Perfect Basement Today—Starting with a Free Quote! At Sunview Enterprises, we love helping homeowners make the most of their unused basement space. Whatever your family's needs may be, we're standing by to create your perfect family room, man cave, or spare bedroom. Call us today to learn more about our basement finishing options and affordable installation processes, or start with a free cost estimate by completing our online contact form now!